Kyocera GEN Series Ceramic Chefs Knife is an affordable and easy to use chefs knife. 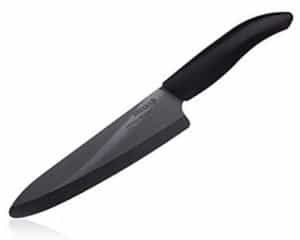 Unlike most chef knives, the Kyocera GEN line uses ceramic instead of steel for it’s blade. It’s ideal for thin slicing, and works well for boneless meats, vegetables, and fruit. The ceramic blade, sharpened to microscopic precision by diamond wheels, is lightweight and balanced. It’s a thin blade, but the extremely sharp edge makes it a great choice for food prep where a lot of slicing and dicing is required. Another benefit of ceramic: it doesn’t stain. It can’t be damaged by any oils, salts, juices or acids found in food. Plus, ceramic won’t rust. This is also good news for your food: trace amounts of copper and iron found in stainless steel can lead to quicker browning of freshly sliced fruits and vegetables. Ceramic does not contain any metal, which can help keep your fruit and veggies fresh just a little bit longer. The polished white ceramic blade is paired with a ergonomic black handle. The handle is comfortable, and like the blade, is lightweight. Ceramic is very sharp and holds its sharpness longer than steel. It’s impervious to the elements that cause deterioration and blemishes on steel knives. These factors create a chef knife that’s perfect for food prep as it can make very clean, thin slices. On the blade’s edge you will find tiny serrations – smaller than those found on a bread knife. These serrations grip the skin of fruit and vegetables, making it a breeze to slice right through them. The serrations even help the blade cut through thick bread, something that can be a challenge for a straight edge blade. This chef knife is extremely lightweight. Not only the ceramic blade, but the handle too. This a blade that’s easy to manoeuvre and use without putting much or any of a strain on your wrist. A ceramic knife is great for some things but you would not want to do other tasks with it, otherwise you are likely to break the blade. This great little video shows you it in action and what not to use it for. Like all ceramic knives, the blade is ‘brittle’. It’s not brittle in the sense that you’ll chip or damage it during use, but any ceramic blade can shatter or chip if it’s dropped or mishandled. Unfortunately, this knife doesn’t come with a protective sheath, so you’ll want to get one to protect the blade from any damage. The blade length measures 7 inches, which is about an inch shorter than your standard chef knife. This isn’t a big deal for most people, but it does make a difference. The ‘sweet spot’, or the part of the knife you’ll use the most, will obviously be bigger on a longer knife. The most unique of the Kyocera GEN Series Ceramic Chefs Knife is, of course, it’s ceramic blade. Ceramic offers a few distinct benefits that steel can’t match – it won’t rust or show stains, it stays sharper longer, and it’s very lightweight. If the task requires a finesse blade for very thin slicing, you can’t go wrong with this chef knife. Kyocera GEN Series Ceramic Chefs Knife – The Kyocera Ceramic knife is the second least expensive option here, so it’s a pretty good value for the price. If you are looking for something a little less traditional, than this could be the best chef knife for you. Consider your cooking requirements and see if ceramic is a good option for you.